Breathe easy, America: Two and a Half Men has just finished filming its first episode with Charlie Sheen replacement Ashton Kutcher, and according to an on-set source, it went "really well." Kutcher’s net worth is also doing “really well” thanks to his new role. His salary of $700,000 per episode makes him TV’s highest-paid sitcom actor, according to TV Guide. It might be considerably less than Sheen’s mind-boggling $1.2 million paycheck, but hey, it’ll buy dinner (or fund an elaborate Punk'd episode). And yet. There’s unavoidable tragedy darkening the corners of this otherwise happy denouement. Sheen’s character, “jingle writer” Charlie Harper, isn’t quietly departing the show. Instead, he will be killed in a brutal accident when he “slips” in a Paris subway, is hit by a train, and is blown apart in a high-protein “meat explosion,” as cryptically described by TMZ. 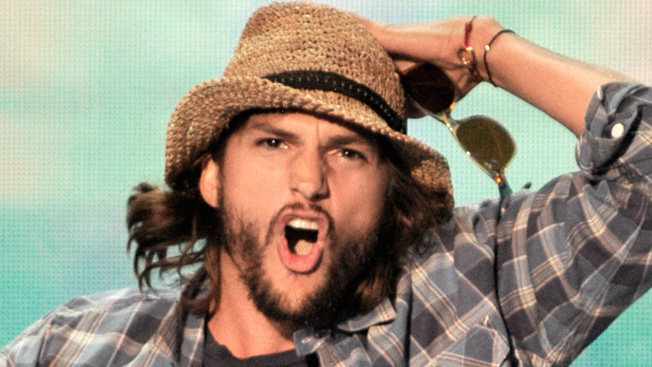 Will Two and a Half Men be a better show with Ashton Kutcher? But wait, there’s more. TMZ suggests that foul play could be at hand, saying that Harper may have been pushed to his death by Rose, the “neighbor/stalker” that he married (because those types of things typically do work out well). So what does Sheen think about all this? The actor told Extra that he’s “rooting hard” for the show’s success. “Who's not going to watch? I'll be there front and center. I'm just as curious as everybody else,” he said, adding that Kutcher is going to “kill it” as his replacement.